“Now, Immortal Sneferu. We move now.” From within the dusty, half-sand-filled chamber, skeletal forms unfurled themselves from sarcophagi. At the centre, an immense altar reformed itself in impossible ways into a mighty throne on which Qahedjet sat. Sneferu took his appointed place at the head of a phalanx of warriors, and waited for the teleportation signal. Novice Milena had to do a double-take when she saw one of the outbuildings of the pyramid complex move. There was a thick heat-haze, and sweat was clouding her eyes on top of that, but she was sure one of the buildings was now floating a few metres above the sand. Not wanting to appear foolish in front of Inquisitor Donel, she decided to say nothing. It was barely any cooler inside the temple than outside; the only difference was the dust was thicker, and smelt of rust and corpses rather than the harsh acidic taste of the sand on the back of your throat. “What do you think, Magos Halpstein?” Explorator Hieronymous saw the world through the greenish haze of his armour’s night-vision filter, and had noticed that a fine pattern of lines on the wall before them had begun to heat up. “There is definitely something behind this.” The tech-priest was chipping at the wall with a chisel, collecting shavings of the strange glossy rock in a beaker. Hieronymous nodded to one of his guards. The man – or rather the cyborg, for by now most of his body had the cold, silvered sheen of Mechanicus upgrades – raised an immense gun and levelled it at Halpstein. Hieronymous relented. In his heart, he knew Halpstein was right. Blasting the door open – or rather, shooting at it, for nobody could really tell if the Tau gun would be proof against these unknown ruins, might cause a cave-in, or activate some ancient defence system. When the Explorator and his retinue reached the surface, they were quite surprised to see Donel had ordered a full mobilisation of the defence force. The sight of one of the temple outbuildings moving towards them was even more surprising. Sneferu was fairly certain that the tank that had just appeared on his unit’s left flank was not running in fear. Along the Imperials’ defensive line, bolt fire rippled out in white streaks over the orange sand towards the approaching enemies. The Grey Knights of course knew what they were fighting. How to fight it. What to aim for. They had not told the labourers at the dig site, or even Donel’s retinue. It was surely the job of the Inquisitor to decide whether or not to inform their men of such trivialities, Brother Garrus felt. He checked the calibrations of his psycannon again, hefting the heavy machine gun to waist-height and aligning its arcane sighting mechanism with the target Justicar Victus had declared highest priority. A flying altar-like contraption made of the same deep purple metal as most of the ruins, on which a skeletal figure sat cradling a polearm as if deep in thought. Garrus fired, his shots joining those of his comrades, and while the first few bullets were absorbed by some kind of force-field, eventually the hexagons of orange light shattered and the tracers ripped into the now-fragile barge. Qahedjet was awoken from the slumber of tactical planning by his throne exploding from underneath him in a hail of machine gun fire. The ancient lord pulled himself to his feet and turned to face the foe who had had the temerity to fire upon his glorious visage. The world went a blinding white for a few seconds and Qahedjet suddenly noticed there was a hole almost a foot across in his torso. As a flock of metal scarabs began knitting the ribs back into place, he scanned the horizon for the source of the blast and spied the human who had defiled his pyramid. That one was going to be his. 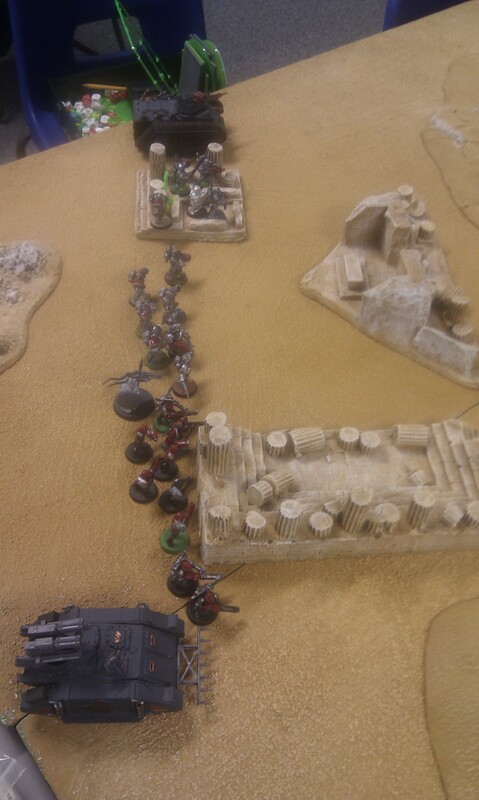 Hieronymous stopped firing as the Necron vehicle crumpled from the sheer number of bullets that it had taken. As its occupant scrambled to its feet, he ordered Halpstein’s guard to open fire. The results were less than impressive; a hail of bullets and plasma shots peppered the sand around the ancient android. One of the junior engineers in the retinue came to an untimely end as his plasma gun, overheating from the relentless sun, gave out completely and backfired. Halpstein ignored the man’s screams and carried on with the intricate preparations for firing his prototype personal-laser-cannon. The weapon used bits and pieces of Eldar technology combined with the thermonic capacitors he had liberated from a Tau battlesuit and the innards of a multilaser to output a significantly stronger beam than most man-portable weapons. The only problem with it was how long it took to charge. When it eventually fired, though, the results were impressive. The beam cut through the dunes, melting the sand around it, and tore a vast chunk out of the Necron lord’s torso. Halpstein made sure he had filmed the shot with his tech-helmet’s built-in camera, and made a note that the aiming system could possibly be a little more intuitive. One day he would make his name in the Adeptus Mechanicus as the man who had made an anti-tank weapon that any Guardsman could use single-handedly. Until then, these Necrons were ideal target practice. 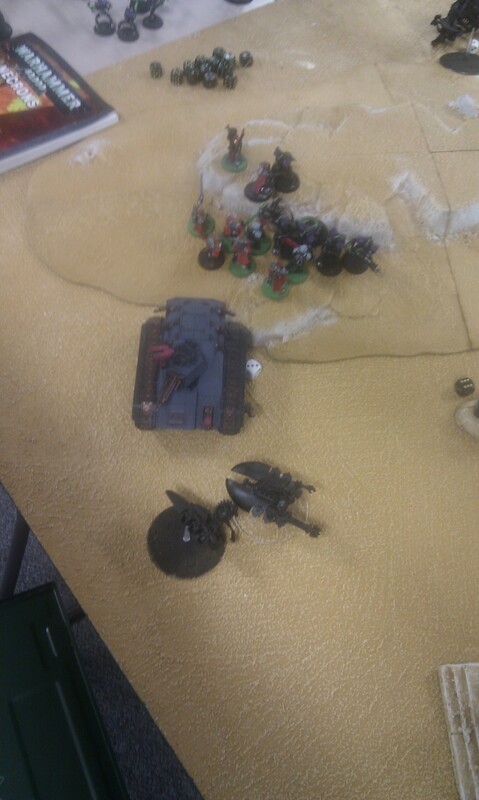 On the battle’s left flank, Donel had ordered her Chimera’s driver to push the vehicle as hard as he could. The transport was bounding across the sand, laying down suppressive fire on any targets of opportunity, while she scanned the horizon for more foes. From before her, with a shimmering arc of purple lightning, two cockroach-like things appeared. Long tails unfolded from beneath them and they pulled themselves up to stand taller than the tank, trailing long, sparking chains from their feeble arms. “Turret! Enemy serpent-construct, five rounds rapid!” She hadn’t even finished giving the order before the Chimera’s gunner opened fire. Lasers flickered in the arid air, apparently dissipating against the construct’s energy barrier, until one struck home and punctured its bulbous head. Powerless, it sunk into the sand. Qahedjet had the situation under control. His barge was destroyed, for sure, and the Wraith Sunai was destroyed, but his host had seen far worse and returned to fight and win. He ordered Sneferu to open fire on one flank at the abomination – the man-machine – that had wounded him. On the other side, he had Nefertiti, the leader of his other phalanx, return fire at the silver warriors who had downed his barge. Sneferu obeyed. It was impossible to disobey, in fact, for Qahedjet had hijacked his brain completely. The Lord could do that. Black-and-purple arcs of light traced irregular, painful to behold courses across the sky and melted the weak humans they found at the slightest touch. On the other side of the wide plateau, Nefertiti and her Immortals also began firing. Their bulky, inelegant weapons fired constantly multiplying and bouncing bolts of lightning that engulfed Victus’ squad in something that resembled an iodinous thunderstorm. When the tesla storm dissipated, Garrus’ armour was reading no life signs, his gun dropped where he had fallen. Qahedjet laughed insofar as he could, seeing the petty metal men diving for cover from Sneferu’s barrage. Now was the time. With a silent order, the animated temple building unfolded to reveal a long-barrelled cannon and fired a single pulse, whipping across the open desert to hit a broken pillar behind which Hieronymous was stood. At the point of impact, there was a momentary sucking sensation like a strong wind, followed by an immense explosion which evaporated the masonry as if it were melting snow. When the smoke cleared, Hieronymous was relieved to see his troops had weathered the blast fine; one of them was nowhere to be seen, for sure, but the all-important servitors and the accursed Halpstein were still alive. Hieronymous ordered his men to carry on firing, pouring fire on the enemy vehicle which had just begun to bombard them. Laser fire from Halpstein’s contraption, plasma fire from the guardsmen at his side, and bullets from his own rotary cannon all bounced off the thing’s energy field until suddenly the barrage proved too much and the shield shattered. Feedback from the overloading barrier sent the vehicle offline momentarily, resetting its weapon’s charging cycle and buying Hieronymous more time. Another of the plasma guns had malfunctioned; something in this planet’s atmosphere was not reacting well in the arcane weapons. Hieronymous had hoped that the modifications with Tau technology that he had made to his unit’s armaments would have protected them from this malign environment, but evidently this was not to be the case. Victus directed the fire of his Grey Knight brothers towards the slowly regenerating Necron lord, bullets tearing into Qahedjet’s body and smashing the precious repair-scarabs before they could complete their sacred duty of preserving their master’s body. Within seconds, the vile android was a pile of broken metallic bones on the desert sand. 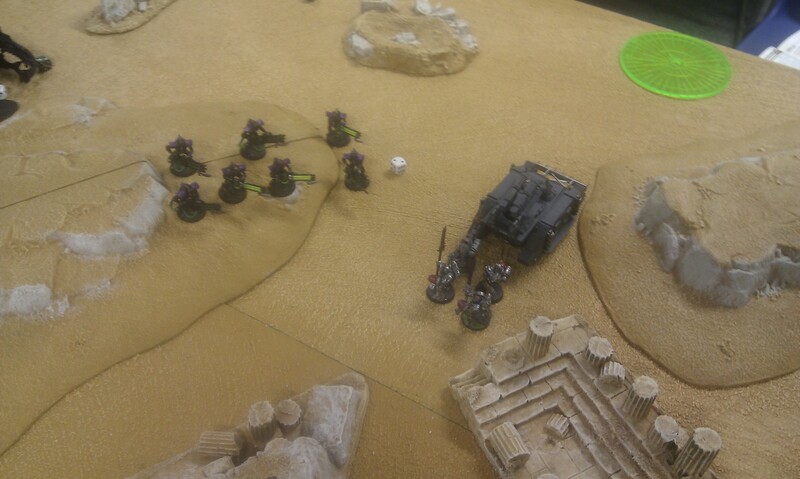 On the right flank, Squad Tigris was rapidly closing on the enemy, their Razorback transport maintaining steady fire on one of the Necron phalanxes but failing to have a lasting effect as the xenos were so ably repairing themselves faster than the tank’s turret-mounted guns could fell them. Sneferu was seeing his phalanx torn apart under the human vehicle’s guns, and ordered them to return fire. He had detected that Qahedjet had been taken offline, and assumed control himself (overriding the usual dynastic protocol that would have activated another of Qahedjet’s court). 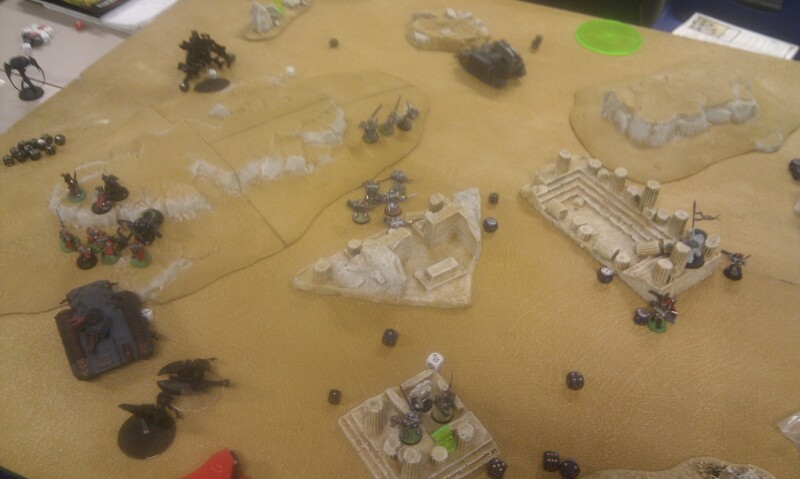 The Immortals’ first salvo went wide, a single pitiful beam scraping armour from the approaching vehicle, but on the left flank Sneferu was watching through Nefertiti’s own vision systems. Her phalanx were continuing to suppress the humans, tesla shots ripping their armour open and frying the flesh inside, and all was good. It was time for Sneferu to spring Qahedjet’s trap. Admittedly, losing one of the precious Wraiths was a painful thing, but that would soon not matter. 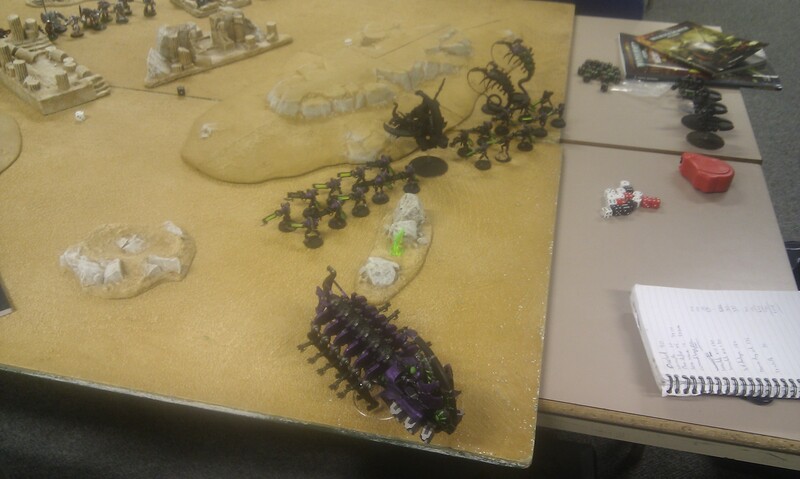 Another bolt of lightning whipped down from the cloudless sky and when the flash faded away four new constructs, Necron torsos on beetle-like flying bodies, were scanning the desert for foes. They found the Grey Knights, and unleashed a formidable salvo. Victus, however, had been prepared for an ambush. 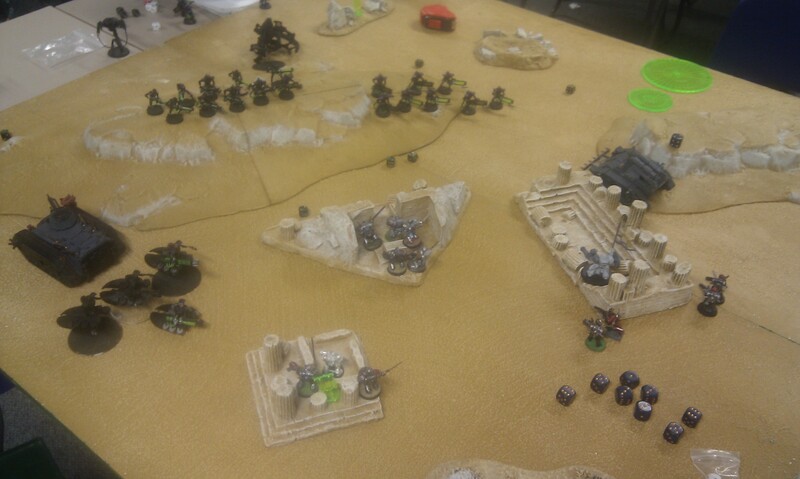 His brothers were already diving for cover while the Necrons were adjusting to their new environment, and the losses from the initial salvo were kept low. It was time for a feint. He ordered his men to fall back, abandoning the ruins they were hidden in, and all the while watch what the enemy did. Sneferu saw the humans retreat and pressed the advantage. The surviving Wraith, Wadzi, slithered towards the larger cluster of humans in one of the temple buildings, drawing close as bullets bounced off its force-field. Wadzi’s shield gave out, however, a little too early; before it could bring its whiplike chains to bear, it was cut down by a wall of fire from the Grey Knights. Sneferu reassessed his tactical position. If the Destroyers could keep the pressure on the enemy, notwithstanding the light tank that had shot on past them, then he could reclaim the outbuildings and from there advance. Squad Tigris’ turret gunner saw the Necron tank beginning to power back up and opened fire at it, a spray of bullets breaking the thing’s fragile spine and sending it ploughing into the sand. With that threat dealt with, what remained was to continue with initial orders – advance and suppress Necron infantry around the plateau. Hieronymous was regrouping his troops, gathering together what remained within the ruins and firing when possible at the enemy troops that made their implacable progress towards him. The things were refusing to die; each one he felled was either replaced from the depths of the tomb complex or brought back to working order by a cloud of scarabs. Destroying the vehicles, with their pulsating shields and horrific weapons, had seemed easy by comparison. 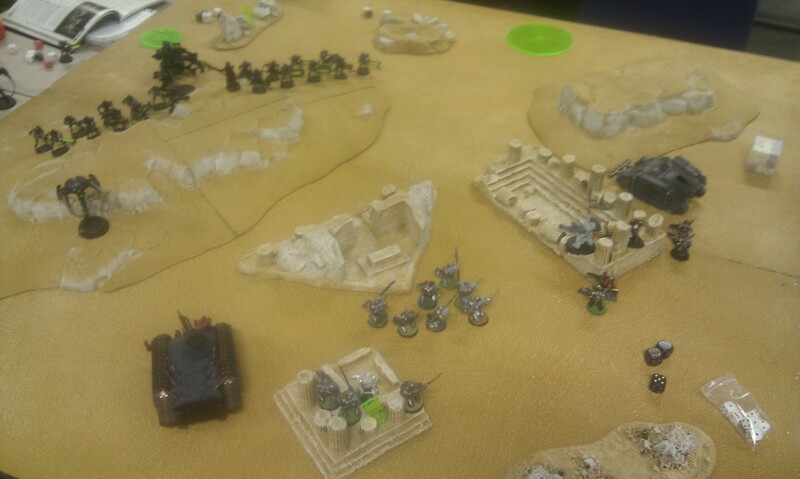 Inside the Chimera, Donel had received the news of the ambush by the flying Necrons, and a plan began to form. She ordered her unit to disembark and move towards the infantry on the plateau, bringing their short-ranged firepower to bear, while the Chimera provided covering fire on the flying constructs behind them. The results were impressive; with the support of Victus’ Space Marines, four of Nefertiti’s Immortals were obliterated in a wall of fire, while behind the advancing unit two Destroyers were plucked from the sky by the Chimera’s multi-laser. Immortal-Regent Nefertiti was wondering why Immortal-Regent Sneferu had assumed battlefield control at the point where the human female had doused her in flames. While the burning had been painful, and the loss of her comrades heartbreaking, it had ultimately not been enough to break the phalanx and she knew exactly what she had to do. As another tesla storm whipped around the humans before her, the Immortals began to lumber towards them ready for when the lightning cleared. Donel saw two of her retinue evaporate in the wall of electricity, and had never been more grateful for her powered armour. Seeing the enemy readying their guns with bayonets fixed, and moving in what was apparently the closest a Necron could manage in terms of a run, she fired again, holding the trigger until her flamethrower’s fuel tank ran dry. Not enough. Not enough had been done. The enemy were upon her, stabbing with their rifles, and all she could do was fight back. The Necrons were slow, for sure, but relentless; each parried strike was followed tirelessly with another, predictable, attack. They did not care. They clearly were not capable of understanding why a strategy failed, only repeating a pre-programmed attack maneuver until the opponent was too slow to parry it. Donel jammed her sword into the ribs of one of her attackers, a much more ostentatious figure which seemed to be an officer of sorts, and saw it crumble, unable to be repaired. Sneferu saw Nefertiti go offline, saw his Destroyers waste another volley and begin to fall to the enemy’s guns, and wondered what to do. His guns were having an effect; the humans were dying, for sure, but too slowly. They were not enough, and without Qahedjet’s authorisation reinforcements were not coming. The enemy were cleverer than Halpstein had initially predicted. Something in the ruins was causing his beautiful plasma guns to malfunction, and another servitor had been reduced to molten metal and charred cloth. It was hard to lay down suppressive fire if your troops kept melting. Squad Tigris figured the enemy were on their last legs; the Necrons, without their leader, were slower to react and no longer so easily able to rebuild their troops. Justicar Maudlin ordered all the Space Marines in the area to focus fire on the larger phalanx before him, and under the weight of bullets five were cut down. Seeing only two left, he ordered a charge, crashing across the open sand as energy bolts whipped around his head. He crashed into the Necron, crushing its metal skeleton easily, and decapitated it in one movement. The other had met a similar fate. On the plateau, Nefertiti’s Immortals were still calmly swinging at Donel’s retinue, cutting two Guardsmen into ribbons as they cut and thrust long after their victim was dead. Were it not so grotesque, Donel figured, it would have been pitiful. She personally brought down two more and with only a couple of their number left, the xenos did something unthinkable – they fled. Well, not so much fled, but dissolved away in the same purple lightning that had brought them there. The last surviving Destroyer, having seen its entire cadre taken down by fire from the human tank, also made the wise decision to vanish. Within the depths of the pyramid, a new Lord began to shuffle into life. Nobody was listening. None of the warriors were activating as they should. The walls of the pyramid, usually pulsing a soft purple, had changed to red. “QAHEDJET II, THE ROYAL COURT DOES NOT RECOGNISE YOU.” Taller Necrons, armed with polearms and shields, were rounding on the Lord. Necron politics were complicated, Qahedjet thought, as the other lords dismembered him slowly and transferred his brain – the excellent tactical brain which had been the destruction of worlds so long ago – into a Scarab. From another throne much like the one now a smoking wreck in the desert, the new ruler of the tomb-world surveyed her armies. It was some days later. Since the encounter, it had been as if nothing had happened. Hieronymous had returned to work with a new fervour that had become quite worrying, claiming there would definitely not be any more enemies. That had been the tipping-point. Anyone – especially an Explorator – who knew what Necrons were knew that they came in far larger numbers than that. It had not been a massive leap of logic to assume Hieronymous was thus under their control. “Oh no, no you don’t. Not this time.” Donel had been warned about this. Hieronymous was unstable. “Oh no, Explorator. It’s entirely LOGICAL. It’s so we could do this if you lost the plot!” Two melta-guns spat their almost-invisible beams at Hieronymous, cutting through his armoured body. As the Terminator armour fell to the ground, Donel spotted a piece of it that had not been there before – an amulet taken from the ruins in the form of a scarab. So that was why Hieronymous had been so opposed to reason? Why he had almost forgotten the battle that had taken place? Simple greed. Tomb robbery. Not heresy. She was about to stamp it into dust when she found herself unable to. There was something about the amulet. If you looked at it right, it looked just like the gems on its back made the pattern of a fleur-de-lys. Surely something – something an Explorator had blessed – could not be evil? Ignoring Hieronymous’ corpse, Donel picked the amulet up and turned it around in her gloved hand.